Farming is a highly technical industry with upcoming technology likely to revolutionise farming practices. With everything from robots to genetics set to play a big part in how the arable sector will change in the coming years it raises some important questions.Could robots be the next green revolution? Or will it be genetics that shape the future of farming? Controversial perhaps, but will farming become a predominantly a desk-job? This year’s Cereals Event (14-15 June) will be getting out the crystal ball to highlight what’s in store for the future of agriculture. Brand new for 2017, the Fields of The Future display will collate innovations and research from the country’s leading universities and businesses to provide visitors with a unique insight into upcoming cutting-edge technology – some of which is market-ready and some which is still in the developmental stage. So what’s in the pipeline? Here are three exhibits visitors should ensure they see at this year’s event. Harper Adams University is running the ‘Hands Free Hectare’ project which will see a crop of spring barley farmed entirely by robots for the first time ever. Having created an automation system and incorporated it onto an Iseki tractor the team drilled the barley at the beginning of April. 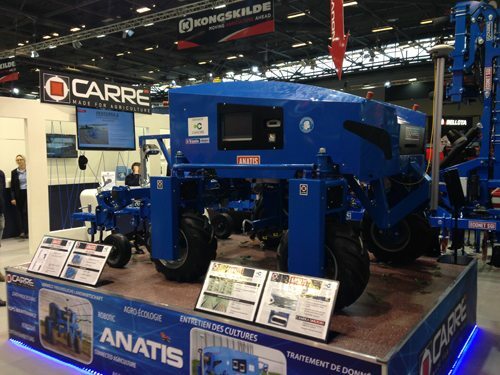 Scheduled to be commercially available in 2018, the Anatis robot is an environmentally-friendly agricultural robot which will assist farmers and growers in their daily tasks. Anatis can independently maintain crops through hoeing and can produce plot reports based on crop data to help farms plan workload efficiently. It will be taking part in a working demonstration at this year’s event. Most blackgrass plants are now emerging within crops rather than before sowing – meaning it is quickly becoming one of the biggest challenges facing many growers. Newcastle University has developed a ‘pregnancy kit’ style test which can detect the presence of herbicide resistance in blackgrass – acting as an early warning for farmers. N8 Agri Food Group – showcasing a variety of research projects to ensure stability of national and global agri-food supply chains. These include projects on disease resistance in wheat (Durham University) and improving yield with new technology (Lancaster University). Bristows – launching its new precision strip till angled disc rapeseed drill. John Deere – debuting FarmSight; wireless connectivity linking field machine data to the farm office, as well as its new blackgrass fighting 750A drill. The Institution of Agricultural Engineers – sharing its latest research from engineers, scientists, technologists and managers working in agriculture and the environment, agri-technology and allied land based industries. Tickets are now on sale via the website www.cerealsevent.co.uk/tickets and visitors can use the promocode CEREALS17TOS to save over 15% on tickets.